These comments by members of EXTEND classes show that there is never a time to stop enjoying the benefits of exercise. Age, frailty, disability or surgery need not prevent anyone from participating in an exercise class. Conditions such as arthritis and replacement surgery are taken into consideration in the designing of the exercises. The EXTEND programme is truly inclusive as the exercises are specially adapted to suit members of various ages, abilities and limitations. You would indeed be surprised to find what movements can be performed from a chair! We move to music of all kinds to improve circulation, maintain joint flexibility and muscle tone. Members who have undergone back, hip and knee surgery are able to march or even waltz and cha cha in a seated position and those who are in wheelchairs derive great benefit from a variety of upper body movements. Our classes are attended by men and women of all ages ranging from people in their fifties to those in their nineties. However, not all our members are elderly – some of our classes are attended by younger people who, for various reasons, are unable to jump or participate in conventional forms of exercise and who prefer to work from a safe, seated position. EXTEND enables members to continue enjoying a recreational activity and a fuller social life through moving to music in an atmosphere of fun and friendship. 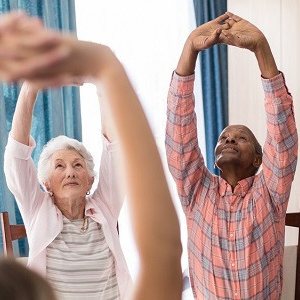 The EXTEND movement was established in the UK in 1976 where it is recognized by the NHS and taught in community centres, retirement homes and special care organisations. It was introduced into South Africa in 1998 by Betty O’Donogue, and is managed from Cape Town under the auspices of The Fitness League.